Everything you need to know about lease upgrades, trade-ins and trade-outs. What Are Your Options When Your Car Lease Ends? Several car buying incentives also are offered on car leases. Some are easier to qualify for than others, but there’s typically at least one you can take advantage of and save some money on your next car lease. Below are some of the most commonly offered car lease incentives. This is likely the most well-known car lease incentive - you’ve likely seen cash back deals advertised in commercials or on billboards. These incentives usually are applied to vehicles that aren’t selling as well as the manufacturer would like. One of the best things about cash-back incentives is that you automatically qualify. All you have to do is sign a lease before a date specified by the manufacturer, and you get a discount on the vehicle. It’s that simple. Cash back incentives typically range between $500 and $5,000. Despite the name “cash back,” you don’t actually get any cash back; the incentive is applied as a discount off the purchase price. One other thing to look into if you’re trying to capitalize on a cash back incentive: most states tax the full price of the vehicle before the cash back incentive is applied, but there are some states that don’t tax cash back incentives. These incentives are offered by manufacturers and are heavily targeted at consumers who are loyal to a particular brand. The goal is to draw customers away from their preferred car brand and get them to lease a different brand. It works like this: a car brand targeted at luxury car lessees may offer an exclusive cash incentive to consumers leasing other luxury car brands to switch to their brand. Conquest cash incentives typically range between $500 and $2,000. 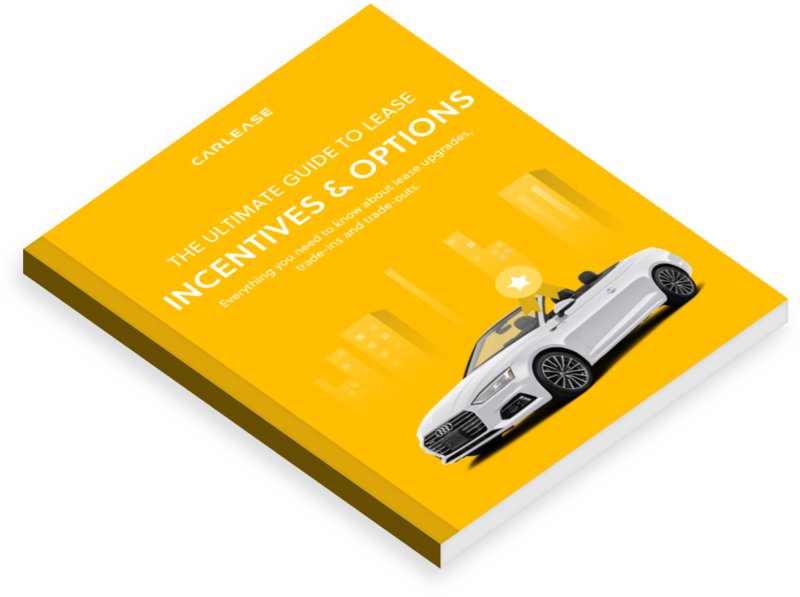 These incentives are especially prevalent in car leasing because many lessees stick to a particular brand, knowing they can easily get the newest model of their existing vehicle once the lease ends. But someone who’s on the fence about switching to another brand may be willing to if they can get a good enough deal. The opposite of conquest cash incentives is loyalty programs. These incentives are used by manufacturers to hold on to their existing customers; they’re offered exclusively to people already driving the brand offering the incentive. For example, if you’re already leasing a car and you’re thinking about upgrading to the newest model of that same car when your existing lease runs out, you may be eligible for a loyalty incentive. Conquest incentives are usually worth $500 or more. These incentives can work a few different ways, but the result is always the same: a reduced monthly payment. One way this incentive is offered is when a car manufacturer sells a particular model to a leasing company at a reduced price, allowing the lessor to offer lower monthly payments. Leasing companies are also able to reduce a vehicle’s monthly payment by offering a subsidized interest rate, which - in the case of leasing - is known as the money factor. Lastly, leasing companies can increase a vehicle’s predicted residual value. By raising how the much the car is expected to be worth at the end of the lease - which decreases the difference between the cost of the car at the start of the lease and the end of the lease - the monthly payment is reduced. Head here to learn more about how car lease payments work, including how to convert the money factor to an annual percentage rate (APR). What you decide to do is determined by a variety of factors, but it will ultimately depend on what makes the most sense financially. You should already know whether you have a closed-end or open-end lease, but just in case you signed the dotted line without knowing, it’s something you can easily find out. Determining which type of lease you signed mostly comes down to whether you use your car as a personal or business asset. If your car is only for personal use, you likely have a closed-end lease. But if you use your car for business purposes, you likely have an open-end lease. If you’re still unsure which type of lease you signed, find out if you’re restricted to a specific annual mileage limit. If that’s the case, you have a closed-end lease. If you did not agree to any mileage restrictions, you have an open-end lease. The reason it’s important to know which type of car lease you signed is because it dictates what you’re responsible for paying when your lease ends. And if you know which type of lease you signed, you’ll have a better idea of what costs to expect - if any. In a closed-end lease, you’re not responsible for the depreciation of the vehicle. But in an open-end lease, you're responsible for covering any negative equity the car accumulates. To learn more about the difference between closed-end and open-end car leases, check out our blog post on why business car leasing makes dollars and sense. The biggest thing to consider at the end of the lease is the car’s value; this will determine whether or not it makes sense to return the car or buy the car. Several factors will be used to calculate the value of the car at the end of the lease, but all you need to know is whether or not the equity on the car is positive or negative. When you originally signed the lease, the car was given a residual value, which is the expected value of a car at the end of a lease. If your car is worth more than the residual value, that means the equity is positive. In that case, you would benefit from buying the car. Once you buy it you could either hold onto it or sell it for a profit. You also could trade in the car and put the value toward a new car. If you don’t want the responsibility of owning a car, you may be able to still trade it in and put the value toward a new car lease. If the equity on the car is negative, you’re probably better off returning the car. You also could renew or extend the lease, in which case the residual value of the car would be recalculated based on the end of the renewal or extension. It’s possible - if the car is taken care of and if it’s market value increases - that the equity of the car will change from negative to positive. One reason people choose to extend a lease is to give themselves a little extra time to get the car in tip-top shape before it’s time to get it inspected. If the car has mechanical issues that need to be repaired or minor interior or exterior damage - such as carpet stains or clear-coat paint scratches - you want to get fixed before the lease ends, a lease extension may be your chance to get that work done before the return inspection. Typically 90 days before the end of your lease, you’ll receive a call from the leasing company about setting up an end-of-lease inspection. This is the leasing company’s opportunity to document any costs that may be incurred by the manufacturer once the lease ends. The end-of-lease inspection is also your opportunity to prove to the manufacturer that you’ve taken care of their car. The best way to do that is to make the car look the same as the day you started your lease. If you’re looking for additional information on how to prepare for the end-of-lease inspection, most manufacturers post their inspection guidelines online. Some even post a sample inspection report. One last pointer that will help you nail the end-of-lease inspection: be nice to the person doing your inspection. They are almost exclusively responsible for how much money - if any - you’ll owe the manufacturer at the end of your lease. We find and negotiate for the car you want on your behalf. Then we deliver it. In some cases, you may want to end your car lease before the leasing period is up. Common reasons for ending a car lease early include wanting to upgrade to the newest model of the vehicle or wanting a new model entirely. Unfortunately, most leasing contracts do not have provisions or conditions where you can get out of your lease early. Even so, you have a few different options if you need out of your existing lease. Read on to explore a few ways you can break your lease. Whether or not you can exchange your car lease is based solely on your leasing contract and your ability to find a suitable new leaseholder. Currently, around 80% of leasing companies will allow you to exchange your lease, including Carlease.com, but not all financial institutions allow these types of transactions. If your leasing company does allow lease exchanges, they will do so for a fee. The cost of exchanging a lease pales in comparison to the costs of terminating a lease early, and the individual taking on the lease exchange will usually absorb most of these costs. Sites like Swapalease.com are marketplaces that connect lessors with people looking to take over an existing lease. It’s also important to check and see if you’ll retain any liability once you’re out of the lease. Around 20% of leasing companies may require you — the original leaseholder — to retain a portion of the liability after the lease has been exchanged. That means you could still be liable for any excessive damage to the vehicle or missed payments. So if the individual who takes over your lease racks up excessive wear-and-tear charges, additional mileage charges, or refuses to pay, the leasing company can return to you to demand payment. In addition, your credit could get pretty banged up if the new customer is late on their payments or doesn’t pay. In the event the new lessee allows their auto insurance to lapse, things can get even stickier. Because of all of these potential negative implications, it’s best to only exchange the lease to someone you know and trust whenever you’re required to maintain some of the liability. Car leases usually include provisions that allow you to purchase the car outright during the term. This can make a lot of sense if your buyout or payoff of the lease is lower than the resale value of the vehicle - especially if you’re thinking about upgrading to a newer model or leasing a different car. For instance, if the buyout or payoff on the lease is $25,000, and the market value is above $30,000, you could purchase the vehicle from the leasing company and sell it. While it may cost you a few hundred dollars in fees, it’s a small price to pay to get out of your lease early. However, to execute this strategy, you’ll need the payoff amount, and you’ll need to know your vehicle’s current value. Even if the market value of the vehicle is a little bit less than the buyout price or payoff, it still may make dollars and sense to use this strategy. This method is similar to the “Purchase and Sell the Vehicle Privately” strategy — except, once you get the payoff or buyout amount, you trade the vehicle in at a dealership. It’s important to understand with this option the dealership will only offer you wholesale value for the car, which will be significantly lower than what you would get if you sold it privately. Although, if you’re not satisfied with the existing car you’re leasing or it’s causing you more trouble than it’s worth, taking a loss on the trade-in may be worth it if it means you’ll be able to upgrade to a newer model or lease a different car. The primary benefit of this option is the dealership will take care of the purchase from the leasing company, and you will not need to worry about taxes. In the event you do decide to trade the vehicle in at the dealership, it’s imperative you get the payoff amount directly from the leasing company to avoid any unnecessary shenanigans. Have you seen a good advertised lease specialty recently? We saw it too, which is why we automatically apply all available manufacturer and dealer incentives to every lease. The simplest scenario is to find a relative or friend willing to take over the lease. But if this isn’t possible, there are several lease exchange websites specializing in connecting you to those looking to take over leases, including Swapalease.com and leasetrader.com. These sites can match you with people looking to take on a lease exchange, as well as handle credit checks and provide the tools to help calculate the fees associated with the exchange. The new lessee will be required to complete a credit application to confirm they’re willing and able to afford the monthly payments. If their credit rating is sufficient, the new lessee will be able to take over your lease with the same interest rate and terms as yours. When everyone is satisfied with the terms, the paperwork is completed to officially exchange the lease. Part of the Carlease.com advantage is that we can take our customers’ existing cars "in on trade" and apply any available positive equity towards their next lease. If you have a trade or off-lease vehicle, please be sure to tell your sales representative so that we can evaluate the vehicle and its impact on the price of the new leased vehicle. Not sure where to start? Need leasing advice? Our team of leasing advisors are here to help.